Comments: This wonderful low growing evergreen ground cover provides year round interest. 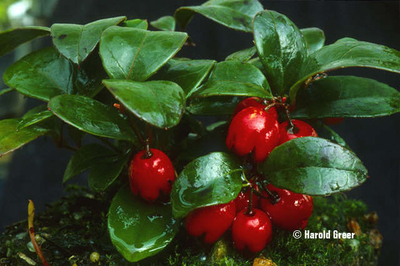 Petite, bell-shaped white flowers with a touch of pink are followed by bright scarlet berries nestled among the glossy green leaves. These will hold throughout winter and into the following spring. The leaves are still used to make tea and the crushed berries have wonderful wintergreen scent. These are well rooted plants, though it's not unusual for them to take a year to establish themselves in a new garden.